1. 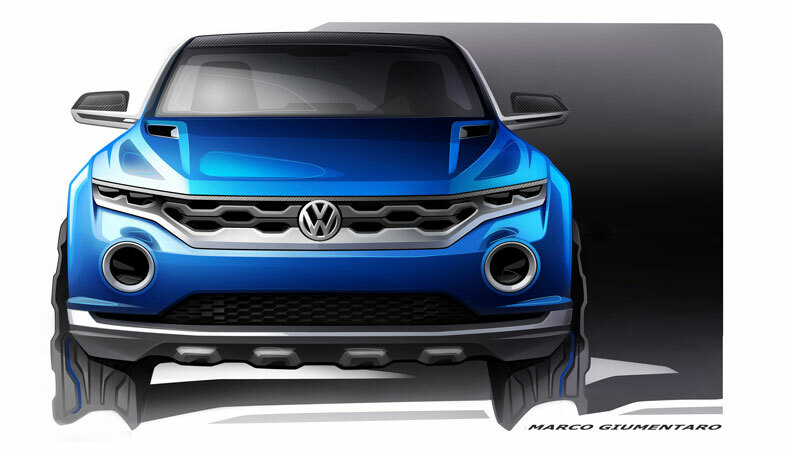 The progressive design of the front end demonstrates a new approach to compact SUVs by the Volkswagen brand. 2. Cameras are at work at the front and rear, supported by LED spotlights in darkness. 3. The roof halves can be removed and stowed in the boot. 4. The T-ROC is powered by a 135 kW / 184 PS turbodiesel engine with 380 Nm of torque. The gearbox used here is a 7-speed DSG. 5. The fuel consumption of the 2.0 TDI is a low 4.9 l/100 km. 6. The concept has the latest version 4MOTION permanent all-wheel drive with a Haldex-5 coupling. 7. The T-ROC can be driven in three different driving modes: “Street”, “Offroad” and “Snow”. 8. Only digital instruments and digital climate controls are used in the T-ROC. 9. A portable tablet serves as the infotainment display. 10. The T-ROC design is based on the modular transverse matrix (MQB) platform. It is 4,179 mm long, 1,831 mm wide and 1,501 mm high. Volkswagen has two of the most successful SUVs (Sport Utility Vehicle) of European origin in its range with the Tiguan and the Touareg. Now Germany’s largest carmaker will significantly extend this range with new models in a wide variety of classes. 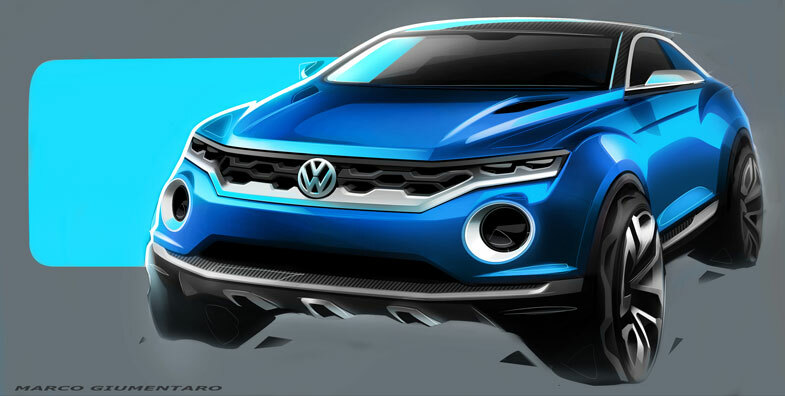 Back in 2013, Volkswagen showed how a large SUV for the USA or China might look with the CrossBlue and CrossBlue Coupé concept vehicles; development of the production vehicle is ongoing. In the mid-size segment, Volkswagen demonstrated in 2012 with the Cross Coupé concept car – another vehicle with a concrete connection to production cars – just how extremely fuel-efficient an all-wheel drive SUV can be with a TDI plug-in hybrid drive system. A compact model in the lower price segment, the Taigun, is in the development phase; the latest version of this SUV concept was presented in New Delhi, India in February 2014. Following now in a world premiere at the Geneva International Motor Show (4 to 16 March) is another vehicle that offers a glimpse at future Volkswagen SUVs: the T-ROC. An SUV concept vehicle one down from the Tiguan in the Golf format, for more than just urban driving. Removable roof halves. 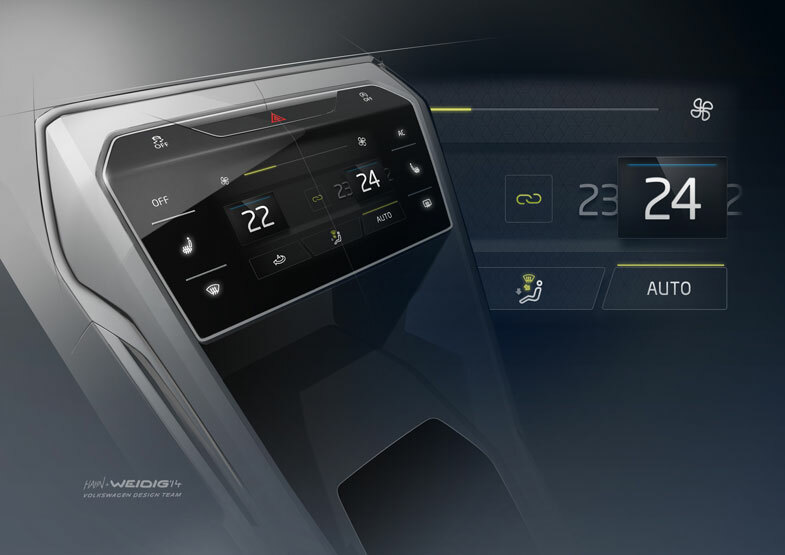 The concept car being presented in Geneva follows a new design and interior line. In addition, the two-door car combines the talents of an all-wheel drive SUV – which does not shy away from rocky off-road trails (“ROCK”) – with the light summery air of a convertible. That is because the middle section of the roof consists of two halves, which can be removed with just a few hand movements and stowed in the boot. 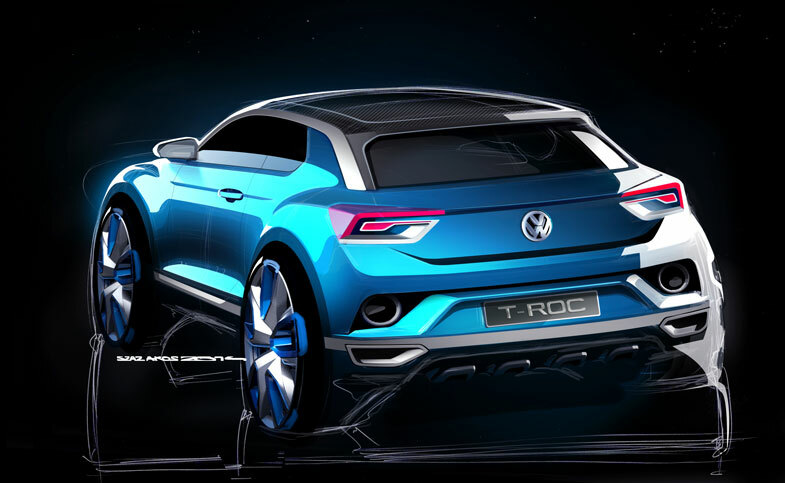 Incidentally, the “T” in T-ROC is a reference to the nomenclature of current and future Volkswagen SUVs such as the Taigun, Tiguan and Touareg. Street / Offroad / Snow. The T-ROC, which is powered by a 135 kW / 184 PS direct-injection turbodiesel engine, is equipped with three different operating modes: “Street”, “Offroad” and “Snow”. Each mode modifies the parameters of the 4MOTION all-wheel drive system, engine, 7-speed DSG (dual-clutch gearbox), ABS and hill start and hill descent assist systems. The modes are activated by an intuitively operated turn wheel on the DSG gear shift grip; the mode that is active is shown in a pop-up window in the fully digital instrument set. Dimensions and weight. The T-ROC is 4,179 mm long, 1,831 mm wide and 1,501 mm tall. It is based on the modular transverse matrix (MQB) platform, and thanks to its lightweight design, the SUV weighs just 1,420 kg. Visually distinctive and in part responsible for the SUV’s proportions are its relatively short overhangs (front: 811 mm, rear: 772 mm) and track widths of 1,578 mm (front) and 1,564 mm (rear), which are large relative to the body width. The wheelbase is 2,595 mm. Front and rear, the SUV is equipped with multi-part 19-inch alloy wheels; 245/45 tyres maintain contact to the ground both on the road and off-road. Forward-looking design. The team at Volkswagen Design, led by Walter de Silva and Klaus Bischoff, has progressively advanced the brand’s SUV DNA in the T-ROC, but at the same time have preserved Volkswagen history. This is immediately apparent at the front end. Distinctive here is the 3D radiator grille designed with large, honeycomb-shaped openings – a new and dominant design element, high and wide in the middle, running out narrower on the sides. In an upwards direction, it is surrounded by a high-gloss black trim strip with a knife-sharp look; on the sides, it is bordered by the dual LED headlights, and at the bottom it is framed by a cross-member in aluminium look. This cross-member that progressively narrows towards the sides is more than just a decorative element; at its outside ends it houses the LED daytime running lights and LED indicators (when the indicators are activated, the white daytime running lights become orange indicator lights). If only the daytime running lights are active, then one LED light point is automatically lit at the centre of each of the dual headlights. The dipped beam light is generated by the out-board LED headlights; when the main beam is activated, this adds the adjacent LED headlights mounted in-board of them. Also visually prominent is the lower section of the front end: it is designed almost as if one were to place a mirror under the radiator grille with its contours reappearing in the lower air inlet. The side of the bumper facing the street is bordered by a rugged underbody protection element. Multifunctional spotlights. A dominant element of the front-end design between the radiator grille and the lower air inlet is a cross trim piece in body colour (“Blue-Splash Metallic”). Towards the sides in this area are the large, round headlight modules, which are visually reminiscent of those of the legendary Volkswagen Karmann Ghia Type 34. However, unlike five decades ago, the technology behind the glass covers can do much more than just generate light. Each of the two round headlights has a strip of three LEDs at its centre, with these LEDs forming the fog light. Above this light strip is a power LED which assumes the function of a swivelling spotlight. Beneath the strip of three LEDs, Volkswagen has integrated a movable camera. Whenever the driver activates Offroad mode, the spotlights and cameras can be activated. Here, the power LEDs and cameras follow the steering angle of the T-ROC; the image of the surroundings is transmitted to a large display (removable tablet) on the centre console, so that the driver can see the stones or potholes in front of the car and drive around them. Design of the side profile… The sides of the car give a clean and powerful appearance. At the top, the silhouette is defined by the contour of the high-gloss black roof which forms a dark line in the vehicle’s silhouette and together with the front windscreen, large roof spoiler and rear windscreen gives the T-ROC a coupé-like contour. Beneath the roof line, an aluminium strip that runs out into the termination of the C pillars makes the car appear lower to the ground than it really is at a height of 1,501 mm. When viewed from the sides, the C pillars themselves look like a roll-over bar that is set far to the rear. 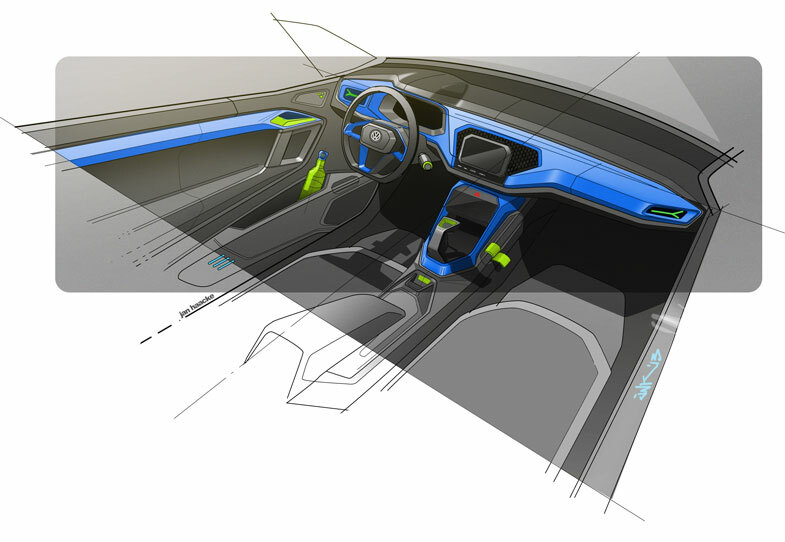 Integrated between this imaginary bar and the front windscreen frame are the removable roof halves. When they are removed and all four side windows are lowered, the T-ROC becomes a convertible, especially for those sitting in front. …is clean and precise. The window line transitions into the engine bonnet and the wings at the height of the A pillar; giving the bonnet an especially long appearance which is further emphasised by the significant rear-ward offset of the front windscreen. In the area beneath the window line, there is what is known as the character line; this light-reflecting edge, upon whose line the door handles are also integrated, runs between muscular wheel arches, front and rear. The upper radius of the rear wheel arch transitions into a horizontal line that finally ends in the LED rear lights – so each line has its purpose. And that is typical of Volkswagen design. Also eye-catching in side profile are the spokes of the 19-inch alloy wheels with interior surfaces painted in body colour. The chrome side sills have a sophisticated look, while the wrap-around off-road accents of dark plastic in “Cool Granite” that protect the body are rugged. Design of the rear body. The C-pillar elements of the boot lid and the roof spoiler are designed in high-gloss black. Beneath them is the consistently horizontal organisation of the rear elements. The LED rear lights have a three-dimensional shape; on the sides they are part of the rear wings, and towards the middle they are part of the boot lid. Like the daytime running light bars at the front end, the rear lights also have visually hovering aluminium elements. The elements of the rear lights adjoining the boot lid are also completely made of aluminium. Rear cameras as well. At the front end, the outer contours of the radiator grille are repeated in the lower air inlet. In the rear body, it is the design of the rear lid lines that appears to be reflected on the surface for the vehicle licence plate. Large round elements are also integrated in high-gloss black trim panels to the left and right of the surface. As in front, three LEDs are integrated in these elements as well, and these form the reversing lights. The power LED above them assumes the role of the rear fog lights here. There is also a camera beneath the three LEDs, which is used to display visual images of the space behind the T-ROC. The images from the rear-view camera are also projected onto the tablet on the centre console. Beneath the round lighting and camera modules and to the sides are the exhaust tailpipes (aluminium, matt with a carbon frame) which are integrated in the bumper and the underbody protection with four aluminium elements. Designed for adventure. The T-ROC is a four-seater with a fully reconceptualised interior. In their functionalities, all elements are designed to match the off-road character of the T-ROC. That is, the features are rugged, with non-slip surfaces and are designed to be used on the move – such as the touchscreen in the centre console that was conceptualised as a tablet and the HD camera integrated in the area of the rear-view mirror. These features can also be used outside the T-ROC. Blue and anthracite dominate. Stylistically, the low-profile dashboard exhibits a horizontal layout. A central element here is the dashpad painted in “Blue-Splash Metallic”. Volkswagen implements painted interiors in production as well, such as in the up! and Beetle lifestyle models. Also painted in body colour in the T-ROC are the door accent strips, the trim panel of the centre console and the trim accents of the leather-trimmed steering wheel that are arranged in the shape of wings. The other interior surfaces – with the exception of the seats – are designed in an anthracite named “Adamantium Dark”. The four leather-upholstered seats, meanwhile, exhibit a colour transition from blue to anthracite. Digital instruments. The controls, status indicators and climate control functions in the T-ROC are all entirely in digital form. Accordingly, a 12.3 inch colour display is used as a combined instrument. Depending on the driving mode – “Street”, “Offroad” or “Snow” – it shows a range of colours and information that is adapted to the given situation. In “Offroad” mode, for instance, the speed range displayed by the speedometer ends at 80 km/h instead of 260 km/h. These interactions are displayed in a fascinating way with flowing transitions and clear animations; the information is visualised by an entirely unique form of digital aesthetics. 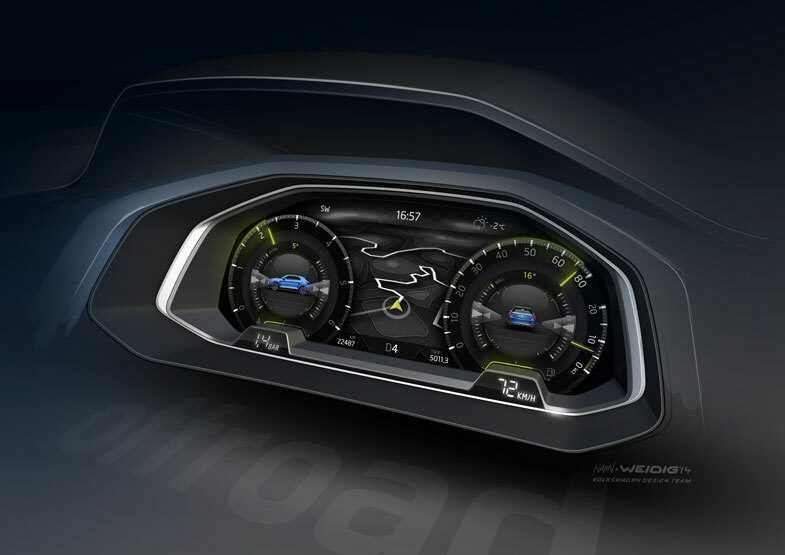 User-configurable infotainment screen. The touchscreen that is used for the infotainment system is a tablet. It is firmly locked into the dashboard with the upper two-thirds of the display extending out from the dashboard. The multitouch display (reacts to finger gestures) is user-configurable. Just like the instrument cluster in front of the driver, the range of colours and information displayed on the tablet also change according to the driving mode. In Offroad mode, the tablet also becomes a screen for the cameras. The HD camera mounted in the rear-view mirror bracket is also controlled from the tablet and can be used to take videos of either the outside or the inside of the vehicle. Digital climate control. The climate control system of the T-ROC also has digital controls. A super-brilliant and high-resolution AMOLED display (Active Matrix Organic LED) is used here. The climate functions are set via this touchscreen. The AMOLED display is integrated into the centre console. Cutting-edge here is the “body-related” operating logic, where the user can set an individual “perceived temperature” – i.e. not just the temperature of the air stream – for different body areas. The climate control system automatically regulates the temperature and fan settings as well as the air distribution for this setting. Showing a love of detail, meanwhile, is the centre console panel; its design of integral straps was inspired by the motocross helmet. Strong and efficient. The T-ROC is powered by a torque-strong and fuel-efficient turbodiesel engine: the 2.0 TDI with 135 kW / 184 PS, the engine that is also used in the sporty Golf GTD. In the concept vehicle, the high-tech diesel delivers a top speed of 210 km/h, acceleration to 100 km/h in 6.9 seconds and a ample torque to the two driven axles (380 Nm from 1,750 rpm). This contrasts with a combined fuel consumption figure of 4.9 l/100 km (equates to 129 g/km CO2). A 7-speed dual-clutch gearbox (DSG) handles the transmission of engine power to the 4MOTION all-wheel drive system. 4MOTION all-wheel drive. In normal operation, the 4MOTION all-wheel drive system, which is equipped with the latest Haldex coupling, transfers nearly all of the engine’s power to the front axle. That is very fuel-efficient. Nonetheless, even in this situation the 4MOTION system continues to be a permanent all-wheel drive solution, because the rear axle momentarily receives more power as soon as slip is detected at the front wheels or the sensors of the T-ROC detect an increase in transverse acceleration. 4MOTION utilises pre-control strategies depending on the specific driving state. This system variably engages the rear axle in fractions of a second via the Haldex coupling whenever necessary. “Street” / “Offroad” / “Snow”. The T-ROC is equipped with three driver-selectable driving modes: “Street”, “Offroad” and “Snow”. Parameters of the running gear, engine-gearbox unit and hill start and hill descent assist systems are modified depending on the mode. The desired mode is activated via an intuitive turn wheel control on the DSG gear shift grip; the mode that is active is indicated in a pop-up window in the digital instrument cluster. “Street”. The standard mode is known as “Street”. The all-wheel drive only directs power to the rear axle if traction or transverse acceleration makes it necessary. “Offroad”. In “Offroad” mode, off-road driving can be optimised at the push of a button. This mode presets the power distribution between the front and rear axles to 50:50 and activates an entire network of assistance systems. The systems integrated here include hill descent assist, hill start assist, more sensitively metered accelerator pedal response, preselection of gears with DSG and ABSplus. The latter utilises a different pulsing frequency on loose road surfaces, which contributes towards reducing braking distance – e.g. on gravel hills. The cameras at the front and rear can also be activated in Offroad mode. “Snow”. When the vehicle is used to go skiing, the “Snow” mode offers an advantage in terms of active safety. As in the “Offroad” mode, in this case the all-wheel drive system switches to a 50:50 power distribution by default. The ABSplus system is also activated. At the same time, the parameter maps for the engine and gearbox are modified for the very low traction that occurs while driving on snow.